My Grandmother – although she spent most of her adult life in England – was born and brought up by Spey Bay in the north east of Scotland. Perhaps most famous for it production of ‘peaty’ whiskey, the area was also endowed with excellent arable farmland. This turned out to be a lucky coincidence as my Nan was fortunate enough to be born into the Watson family who owned large tracts of land in the area. Specialising in the production of ‘nips’ and ‘tatties’ (parsnips and potatoes to the rest of us), the wealthy Watson family had one of the largest farms in the area – larger still than the Baxter family who are now well-known for their up market brand of ‘Baxters soups’. Although farming rivals, my Nan was briefly engaged to be married to the young Mr. Baxter, but unfortunately this engagement was not to last. Why? Because she chose a life of love over privilege by marrying my Grandpa Bert. 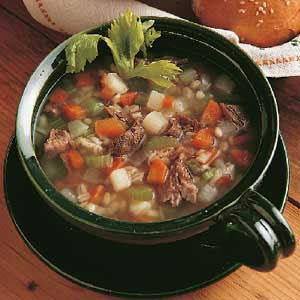 But this isn't a story about my Nan, this is a story about my Nan’s Scotch Broth, or as she would have called it – broth! 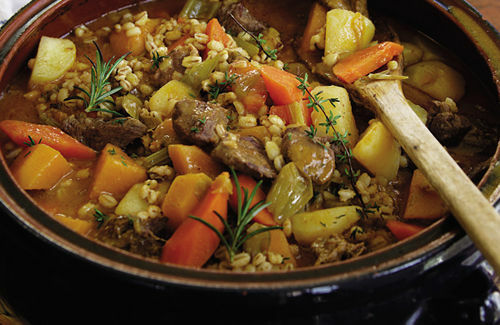 Now traditionally lamb is used for Scotch broth, but my Nan usually used chopped chicken breasts. However, the recipe is basically the same for both meats and so I have included both in this recipe - just go by the sections that are relevant to you. 1.5 litre (2½pts) chicken stock, or lamb stock if you are cooking with lamb shoulder. 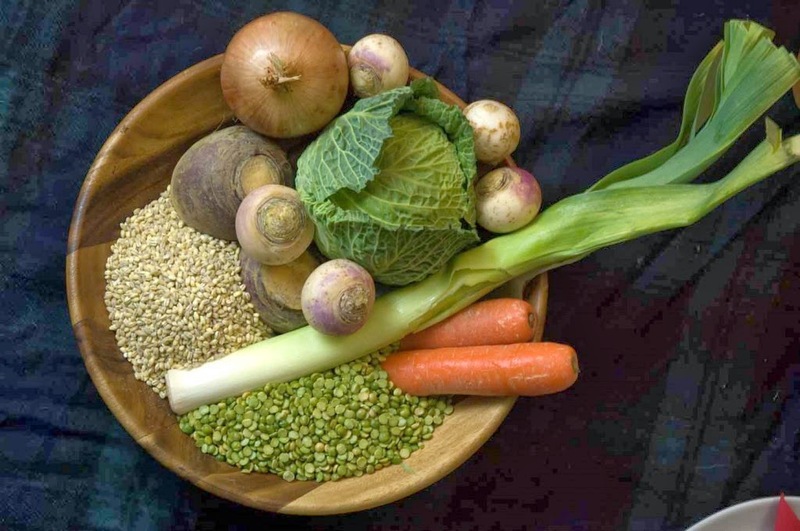 Put the pearl barley into a bowl of cold water, then set aside to soak. Meanwhile, place the chopped chicken or lamb into a large saucepan or flameproof casserole dish and cover with the appropriate stock. Bring to a simmer and skim off the scum. Now add the onion, bay leaf and thyme to the pan. Return to a gentle simmer and cook for one hour, skimming occasionally. Add the carrots, turnips, parsnips, leeks and celery to the broth. Season with the salt and freshly ground black pepper. Bring to a very gentle simmer, cover with a lid and cook for 30 minutes. If cooking with lamb, lift the lamb out of the pot with tongs or a large fork and put on a board. Carve off all the meat, slicing or tearing into largish chunks and discarding any skin and bone. Season the broth with more salt and pepper to taste and spoon into large, deep plates. Divide the lamb between the plates and sprinkle with freshly chopped parsley. If cooking with the chicken then serve evenly into suitable bowls. Add salt and pepper to taste and sprinkle with freshly chopped parsley.